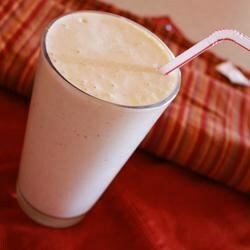 "Refreshing and healthy protein smoothie made with fresh oranges, bananas, strawberries, sherbet and cranberry juice. Save money by making your own fruit smoothie at home versus going to a juice place!" Place cranberry juice, banana, orange, strawberries, sherbet, ice, and protein powder in the bowl of a blender. Blend on high speed until smooth, about one minute. Adjust the consistency by adding more sherbet if it's too thin, or more cranberry juice if it's too thick. Pour into two glasses and use a straw! I used a cup of drained mandarin oranges instead but Loved it! My 8 yr old daughter even loved it! What a great way to start your day! I used a frozen banana, which eliminated the need for ice cubes. I also used frozen raspberry yogurt, instead of sherbet. I made no other changes. VERY good. I enjoyed this a lot. We LOVED this smoothie! We used cran-raspberry juice and orange sherbert instead of raspberry because it's what we had on hand....YUM! !